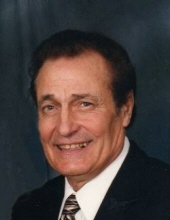 Fairfield – On Monday, April 1, 2019, at the Northwestern Medical Center, Albert Tetreault passed away with his family at his side at the age of 88. Born in Newport, Vermont on February 7, 1931, Albert was one of eleven children of Eva and Ambroise Tetreault. He spent his entire working life before his retirement as a self-employed, award-winning dairy farmer. On September 3, 1960, Albert married his best friend and the love of his life, Jacqueline Lussier, with whom he is now reunited since her passing on December 13, 2016. Together, they raised their two children on their farm in Fairfield. In the early days he spent his spare time sugaring his woods, building 2 houses, and restoring and selling 2 other farms. Albert retired at the age of 65 after milking cows for 60 years. Albert and Jacqueline converted their home into a bed-and-breakfast. There, hundreds of guests from around the world for more than 30 years enjoyed visiting the farm. In between serving guests at his home, Albert enjoyed spending time with Jacqueline and their two children and three grandchildren, maintaining the grounds at home, traveling to many places inside and outside the United States, and sometimes just visiting the sugarhouse and cutting wood with Stephen. Recognizing the importance of volunteering in his local community, Albert spent more than 20 years serving on advisory committees including the Town of Fairfield Zoning board, Fairfield Water District #2 board, Bent Northrop Library Board, and was a consultant for various building projects. Albert also served the Northwestern Medical Center as an incorporator and board member, and as board president during Northwestern Medical Center’s first expansion project. Albert was also a mentor to many children and young adults in Fairfield over the years, and was always willing to help someone out in times of need. Albert leaves behind two of the best children one could ask for: Dr. Lynne and her husband, Steven Corry, of Saco, Maine and Stephen and his wife, Lynn Tetreault of St. Albans. Additionally, a constant source of pride and joy Albert loved dearly, he leaves three awesome grandchildren: Emma, Benjamin and Rebecca Tetreault of St. Albans. Albert was affectionately called “Pappy” by them, a name given to him by Emma as a toddler. He also leaves his brother, sisters and their spouses: Denis and Cecile Tetreault of Coaticook, Quebec, Canada, Helene and Philippe Plante of LaRochelle, France, Marielle Tetreault of Riviere-du-Loup, Quebec, sisters-in-law Cecile Booth and Barbara Tetreault, sisters and brothers-in-law Jacques and Marcelle Lussier, Nicole Paine, Estelle and John Quintin, Michel Lussier, Micheline and Earle Goodno, Claire and Roger Rainville, numerous nieces and nephews, and many friends. In addition to his parents and his wife Jacqueline, Albert was predeceased by his brothers: Yvon, Jean, Norman, Raymond, Bernard and his wife Marie, his sisters and their spouses, Germaine and Leo Willey and Lucille and Stephen Prebish, brothers-in-law Real Lussier and Michael Paine, niece Shirlene Geoffrey and her husband Raymond, nephews Paul, Andre and Roland Tetreault, and Mark and Justin Lussier. Relatives and friends are invited to attend calling hours on Tuesday April 16th from 4:00 to 8:00 PM at the Heald Funeral Home, 87 South Main Street, St. Albans. A Mass of Christian Burial will be celebrated on Wednesday April 17th at 11:00 A.M. at St. Patrick Catholic Church on Church Road in Fairfield. Interment will be in the St. Patrick Cemetery at a later date. In lieu of flowers, memorials may be made to the St. Patrick Church, P.O. Box 18, Fairfield, Vermont 05455. To send the Tetreault family a message of condolence or share a memory, kindly go to Albert’s online guestbook at www.healdfuneralhome.com. To plant a tree in memory of Albert Tetreault, please visit our Tribute Store. "Email Address" would like to share the life celebration of Albert Tetreault. Click on the "link" to go to share a favorite memory or leave a condolence message for the family.